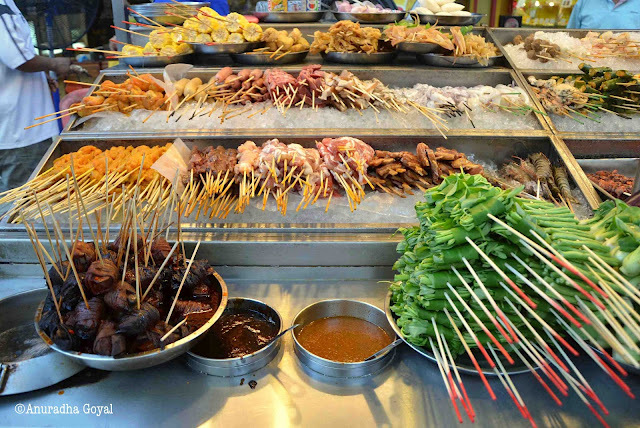 KL can be an exciting place for foodies with its incredible variety of street food and cuisines – brought together by the different ethnic groups that make up this interesting country. I had a chance to sample a selection of foods, some for the very first time. 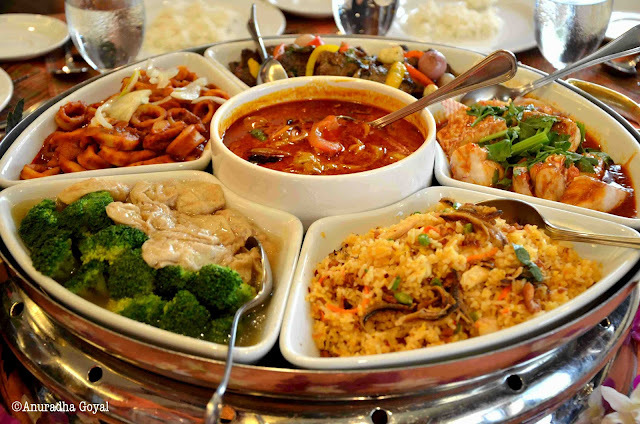 There are three distinct sets of cuisines associated with the major ethnic groups: Malay, Indian and Chinese, but there are also some lesser known ones such as Nyonya (of the Straits Chinese ethnic group) and Sarawak (a community that lives on the island of Borneo). Madam Kwan’s is a restaurant on the 4th level of KLCC that offers local Malay cuisine. The popularity of this place during lunch was easy to see: there was a long line of people outside waiting for seats. 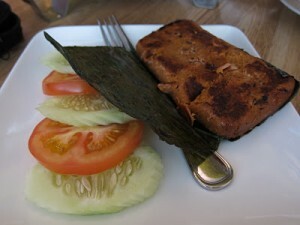 Malay food has a lot of similarity to that of its neighbours, Thailand and Indonesia, but with some unique twists. Belacan and Assam are probably the most common ingredients you will find in their dishes. Belacan is made from fermented baby shrimp which is then dried and formed into small cakes. A tiny amount is added to most Malay dishes to add that special ‘kick’. 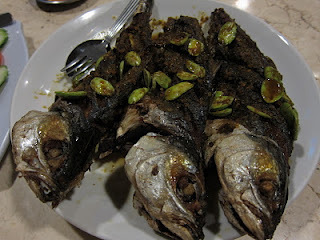 Assam is essentially tamarind paste commonly added to fish and vegetable dishes to make them more tangy – probably a practice that came from South India many years back. 1. 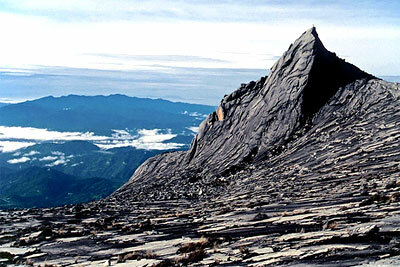 MOUNT KINABALU: Climbing the world’s 20th highest mountain. An outdoor treat for adventure lovers, Mount Kinabalu in Borneo is an amateur climb with gorgeous landscapes, that peaks in a breathtaking sunrise. The first half of the climb takes you through high-cut steps, with the surroundings gradually transforming from tall trees to small shrubs, and typically takes 5-6 hours. The more grueling second half starts at 2 am in the morning, when you set out on bare, sometimes vertical rocks, a torch fixed on your forehead to light the way, and ropes clutched in both your hands. You only know you’re heading up, oblivious of the straight fall below, because there’s no way turn your torch around. At sunrise, you reach the Low Peak, 4,095 meters, and feel like you own the world. You never forget the first rays of the sun that promise to keep you warm. And if you’re a beginner at climbing, you never forget the adventure that is descending the vertical slopes, either. An overnight stay at Laban Rata to break the climb is compulsory, as is hiring a guide. 2. 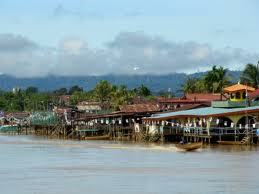 TAMAN NEGARA: Exploring the world’s oldest tropical rainforest. If you’re game to get your hands (and feet) dirty, the jungles of Taman Negara National Park will charm you with their ancient canopies and unique biodiversity. 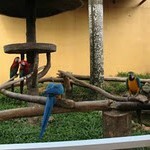 You can seat yourself in a quiet corner of the jungle and fascinate yourself with hours of birdwatching. Or you can set out deep into the wilderness, where no one can promise what (who) you might find. The limestone caves of Taman Negara aren’t for the faint-hearted. You could be a dodging a giant insect or caressing a bat on the roof of the cave, with only the dark protecting you. The Orang Asli tribes that live in the jungles of Taman Negara may not be easy to interact with directly, for more reason than the lack of a common language, but their nomadic settlements might inspire your wanderlust. 3. Pulau Perhentian: Snorkeling with sharks. The more popularly known Malaysian beaches of Pulau Tioman & Pulau Redang might have waters almost as azure and underwater life almost as beautiful as Pulau Perhentian, but neither of the two offer you the chance to snorkel alongside black-tip sharks or smoke shisha on the beach on a night lit only by the moon and the stars, with the waters receding into low tide. Your boatman will tell you that the sharks are not man-eaters, not until they’ve tasted human blood. You’ll believe him, cross your fingers that no human blood seeped into their territory while the boatmen were gone, put on your snorkeling mask, and begin your chase. You’ll feel your hair stand in the water when you catch your first glimpse, and be glad you survived to tell the tale. We, a group of three families, decided to visit Malaysia that has something for everyone, beautiful beaches and theme parks, and is also a shopper’s paradise. The moment our flight landed in Langkawi, the fun began. It was drizzling and the weather was perfect. On our way to the hotel, we were surprised to see absolutely clean roads. We were instantly in love with the beautiful beach city. 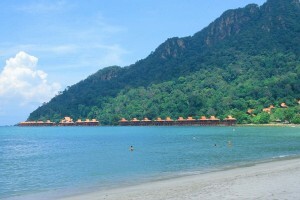 Langkawi is an old place that literally means The Red Eagle. We visited the famous emporium and proceeded to the water world. It had hundreds of species of fish and birds. All the children had great time getting clicked with the penguins. Thereafter, we visited the Eagle Square. It is a lovely place with a huge red eagle facing the sea. We also enjoyed various water sports such as parasailing and jet skiing. 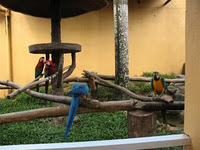 The next day, we went to the bird sanctuary. It was a wonderful experience to see such a variety of birds. We even got clicked with birds perching on our shoulders. Thereafter, we went to the crocodile farm. It was a very unique concept and we were amazed at the bravery of the keepers who weren’t afraid to put their hands into a crocodile’s mouth, at the crocodile show. On our last day at Langkawi, we saw the famous skywalk, made even more famous in the movie, Don 2. It is a great place at a height of 752 metres above sea level. The trolley covered this distance quickly and it was simply awesome to be amidst the clouds and see the beautiful beaches and the sea from this height. 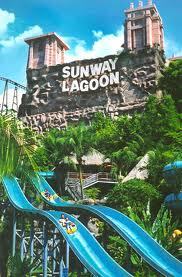 In Kuala Lumpur, we visited the Sunway lagoon, famous for various themes parks and rides. We thoroughly enjoyed ourselves at the big water park, especially the rollercoaster ride. We also visited the famous Petronas twin towers and went up to the midway structure. The experience is humbling, to say the least. At such a great height, everything below looks small and we marvelled at the giant structure built by man. In the evening, we shopped at big malls. China Town market is also a great place to shop as it is not very expensive and one can get good quality stuff. 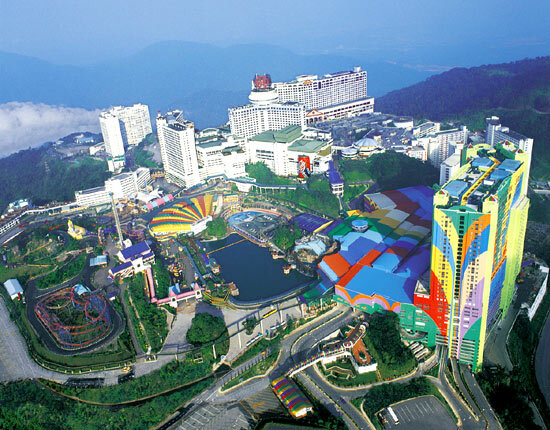 Next day, we went to Genting Highlands theme park. The drive was great. It seemed that the clouds were rushing to meet us and we gently inhaled the fresh air of the mountains.At the theme park, the children took part in many activities and enjoyed the rides. We were slightly disappointed, as we could not do the outdoor rides due to inclement weather. On the last day of our trip, we did some local sightseeing and visited the Chinese temple, the palace, city tower and other famous places. This was a beautiful trip and will remain etched in our mind for a long time. Every bus in George Town drives up to the jetty. That’s where you get the hint. 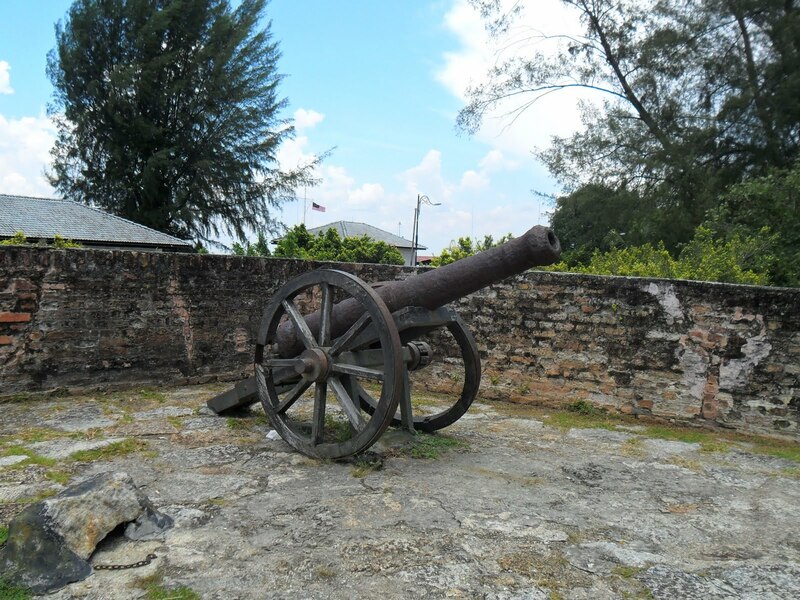 When you get off at the jetty, look around and the old wall peeping at you is probably the back of Fort Cornwallis. George Town is a well developed city today and has more office buildings and tourist centers than the heritage buildings. 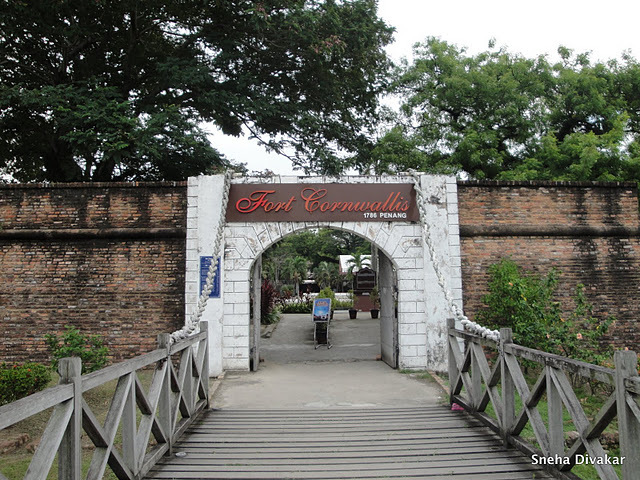 The entrance to Fort Cornwallis is an open ground which also serves as the entry park to the beautiful promenade and while you admire the promenade and those faraway ships, the little fort can just about hide away from your eye. Spanning a small area of no more than a swimming pool, the fort has cells which were used in the British Colonial days for prisoners. Now these have history boards of the British Generals posted in George Town. A good read if you are interested in History. There is a little Chapel. Little means very little, just a room. If you walk around and up the fort, there are the fixed firing canons facing the sea and arms storage rooms. That’s pretty much Fort Cornwallis. What did I expect? I mean, I was raised in a city that was previously a British cantonment but never bothered to visit the fort or dig out the colonial history. Because it was all around me, living and merging into the present day’s life. 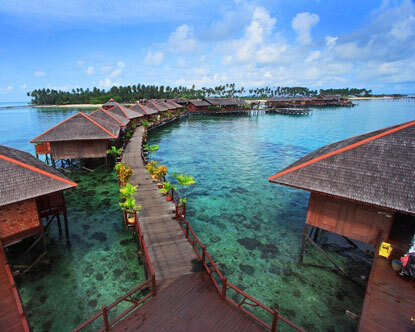 Land of ready smiles and incredible contrasts – Malaysia! And of course there was this cultural village where the ethnic folks lived and sold their wares. One got to see lifestyles, handicrafts, clothes, music, games, arts of many different cultures. Plus there was this fantastic restaurant which we went to a couplea times – great ambiance and personalized service. And of course without fail there had to be a handicraft shop to splurge on – so if I had to buy souvenirs and memories here’s where I’d go. I didn’t buy anything from there as on my multitude visits to M’sia before, I’d done enough and more crafts shopping. The beaches are lined by palms and are mercifully not populated, one odd person you may chance upon if you really look! Gives you the privacy, the quiet serenity and uplifting calm you seek. Totally my kinda place. Though I wish there were some arrangements for food nearby. Yes I remembered Goa oft. My friends went diving into Sipadan island nearby and they were gung-ho about the colourful tropical fish and corals in its crystal clear waters. So if you are headed to Malaysia then I would recommend less time in KL, no time at all in Genting and a must see for Sabah and Sarawak. These are virgin places, full of folklore and stuff to discover, touristy to some extent but – breathtaking nature which you hardly get to see and feel and imbibe if you are a city dweller like me. Smiling land of people blessed by nature! [ | | | on this server.